Lopez, J.; Alonso, C.; Crespo, I.; Serra, R.; Coch, H.
Visual comfort is usually defined in terms of illumination level, with the consequent disparity of values found in publications. However, transitional spaces have different features, such as dynamism and adaptive process, compared to other static spaces in buildings. Therefore, other factors must be considered when assessing the visual response. This study focuses on the quality of light and atmosphere and their relationship to other features such as space design. With this aim, four parameters were determined to evaluate the visual perception in a case study, namely the entrance areas of Caixaforum in Barcelona. Data collection and analytical observation were performed, and later the response to visual comfort and space design was evaluated. Although this is a single case study, the scope of this method could be all kind of entrance halls in Mediterranean climate. The results make it clear that visual comfort depends on many perceptive and spatial factors. López, J. [et al.]. 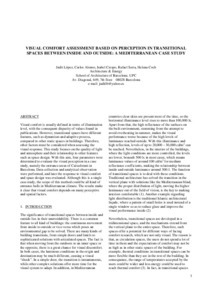 Visual comfort assessment based on perception in transitional spaces between inside and outside: a Mediterranean case study. A: World Renewable Energy Congress. "Proceedings of the World Renewable Energy Forum". Denver, Colorado: 2012, p. 1-7.